Now I can say Captain MS Dhoni made big blunder in taking some decisions in the series because of which India lost the 5 match ODI series 2-3 to Proteas. There are only 2 two reasons which were responsible for India's debacle in ODI series. We also have few positives from the series as well. But before discussing positives we need to look at the reasons of debacle in the ODI series. Reason No.2 : Failure of top-order batsmen. Point No.1: Wrong decision of fielding first after winning the toss in final ODI. Centurion pitch always have something in it for the seamers initially but it is not unplayable and knowing that we already won match even after scoring 190 runs then why to put opposition into bat. Proteas always choked under pressure and here also they would have under-pressure if they batted second. Point No.2: Wrong team selection in the do-or die final ODI. When MS Dhoni have decided before entering the ground that he will be going to field first after winning the toss considering that pitch will have something in it for the fast bowlers then why did he included spinner. If MS Dhoni was not happy with the Nehra's performance in the series then he had the option of playing Sreesanth or Ishant but he opted for Piyush Chawla. Completely illogical decision. Point No.3: MS Dhoni made big tactical errors while fielding. In the second last ODI at Port Elizabeth, he set the defensive field for Proteas after reducing them to 118 for 5. Had he put the pressure on Duminy and Botha and provoked them to play aggressive stroke then I think we would have got their wickets and India could have easily stopped South Africa to 170 or 180. He made same error in 3rd and final test match in Capetown. Even when Peterson came into bat in 4th ODI he continued with defensive field and never applied any pressure by setting aggressive field. In final ODI also he did same mistake as he opened the field for Duminy and allowed him to take easy runs and helped Amla and Duminy to build partnership. Point No.4: Why MS Dhoni brought Piyush Chawla into attack in the 8th over. Pitch was having seam movement and both Munaf and Zaheer troubling the batsmen but MS Dhoni removed Zaheer from the attack just after his 3 overs. Really fail to understand what kind of tactic that was. Point No.5: Experiment with Piyush Chawla back-fired as he proved costly in terms of economy and also failed to pick-up single wicket. 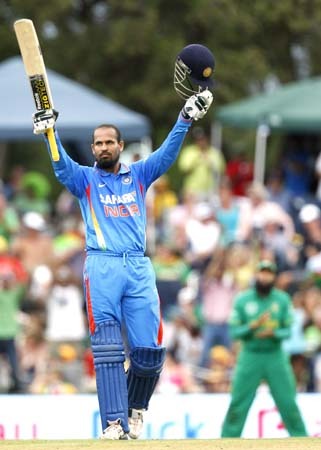 Point No.6: MS Dhoni made big mistake of leaving out Yusuf Pathan from the first 2 ODIs. In final ODI none of the top-order batsmen including Dhoni failed to show little application of staying at the wicket. I believe Dhoni had big disbelief in Yusuf Pathan's ability thats why all the batsmen were instructed to go bang-bang which resulted into batting disaster. 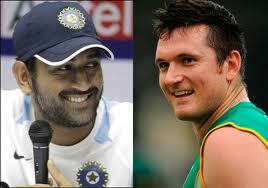 If Dhoni had shouldered some responsibility then I believe India would have easily won. Point No.7: Persisted with Murali Vijay even after his repeated failure in ODIs and leaving out in-form Parthiv Patel from 3rd ODI. Point No.8: Persisting with part-time bowlers in the situation where opposition lost their major wickets. Had MS Dhoni brought in his strike bowlers into attack in those situations then I believe India would have ended on winning note in this series. Point No.9: Not talking to Suresh Raina about his batting as in 3 ODIs Raina threw his wicket after spending some time on the crease by playing reckless shots. Point No.10: Giving unusual excuses after the loss like opposition team's batsmen also struggled to score runs or series has become more interseting after 2 all. MS Dhoni forgot that South Africa reached score of 250 thrice in the series and India failed to play their quota of entire 50 overs in all the matches forget about reaching 250 mark which they failed to achieve in the entire series. Point No.1: Rohit, Vijay, Yuvraj, Raina and MS Dhoni failed to achieve average of 20 in the series also none of these batsmen crossed even aggregate100 run mark in the series. In short entire top-order with exception of Virat Kohli failed to make a mark in the series. Point No.2: None of the top-order batsmen showed little application in crucial stages of the match except Yusuf Pathan, and Virat Kohli. Parthiv was unlucky to be given out in the final ODI when he was comfortably playing all the South African bowlers. There are few positives also came out from the series and that is Virat Kohli, Yusuf Pathan, Yuvraj's bowling and Harbajhan's all-rounder capabilities.Fielding and catching looked far more improved in this series for Team India. For Proteas, I believe they won this ODI series or drew test series not because they played good cricket but they won ODI series and drew test series because our captain given them these series in plate by taking senseless decisions in both the series. Hashim Amla, JP Duminy. Lonwabo Tsotsobe and Morne Morkel were stand out performers of the series for Proteas. AB Devilliers was the big disappointment of the series from the Proteas point of view. Faf DuPlessis and Morne Wan Vyk are big gains for Proteas from the series. Over all very good tour as all the 3 series in Test Match, T20 and ODI were highly competitive and good cricket was played by both the teams as both the teams fought hard for supremacy. According to the form of work out you will be performing, that you are now in a position to obtain distinctive different types of adjustable dumbbells with specific price tags. If you're on the tight budget and are unable to manage 1 from the extra leading-edge Bowflex fitness centers, the Bowflex Blaze is worthy of a appear and gives a very good benefit for beginner consumers. confusion, super sets, circuit instruction and high-intensity interval training. Also the researchers uncovered that aerobic riders don't hold up around the very long run. If you plan to buy household fitness center gear, then you ought to understand the differences among several devices. horsepower of your motors in the tools. agent did assist stroll him as a result of the adjustments about the cell phone and finally was in a position to get the belt centered properly.